To continue our hatching series, we’re going to look at colourful hatching with pastel. We are also going to see how you can learn from your favourite artists. It’s best to watch the video to see the demonstrations, but we’ve also written out the tutorial with screenshots below if you prefer. Mayko loves to use bold and colourful hatching in her figure drawing. She is also a fan of Degas, who liked to draw figures powerfully with pastel. So studying Degas is a perfect opportunity for her to develop her skills and understanding. Here Mayko is copying one of Degas’ pastel works so that she can learn about how he hatched with pastel. Later she is going to apply the lessons she learns to help her do this portrait. We don’t have special technology to disentangle the layers and the exact process he used, so she is just looking at the final product, doing her best to reproduce what he did, and seeing what lessons his work can teach us. She first drew the rough shape of the figure and made a kind of tonal map with charcoal. This charcoal is a foundation, but it’ll be covered by layers of pastel. To regain these lines that help with the structure, she will come back with charcoal again later towards the end. Some of the lessons from Degas she realised consciously in her mind, but so many lessons are sub-conscious, learned in her eyes and arm through action – intangible insights that she wouldn’t be able to put into words and write down. After charcoal, she started with Burnt Umber. Different brands make quite varying colours with the same names, especially with soft pastel since the ratios of pigments varies, so instead of using the names, we are just going to show the colour and describe it. She put down some dark brown next, and she tried to find similar greens to Degas’ ones, but couldn’t! So she just used what she had, and she’d note what effect that had on the drawing. The basic method she is using here is to apply dark and cool colours first, usually used for the areas of shade, then go to warmer colours. The reason for this is that cooler colours and darker tones tend to draw the viewer’s eye into the drawing, while warmer and lighter colours come out of the drawing. So when it’s possible, it’s useful to put down those darker and cooler colours that create depth in the drawing first, and then layer the warmer and lighter ones that come come forward on top. She can do this with pastel because it’s so opaque and has such strong covering power. Watercolour for example tends to be a more transparent, so adding warmer layers on top of cooler ones would not work the same way. When colours started to look patchy, she applied skin tone lightly across a large area to unify the whole area. Degas is famous for his spirit of experimentation. He used all sorts of techniques, some were traditional, and others his own invention. He even used pastels on top of oil paint sometimes. For his pastel work, he used fixative and steam so that he could apply many layers of colour. If you aren’t using these techniques, you cannot add too many layers of pastel – at some point the layers won’t adhere properly to the paper. Pastel is mostly pigment powder – it doesn’t have as much binder as wax crayons for example. If you’re using rougher paper like Ingres paper which she is using here, it’ll probably take more layers than if you were using cartridge paper. 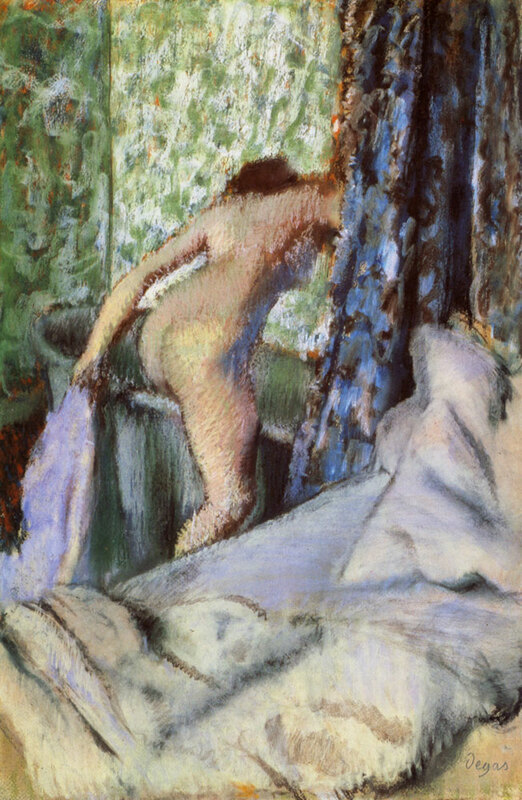 Another thing she learned was that Degas applied colourful hatching very boldly and freely. 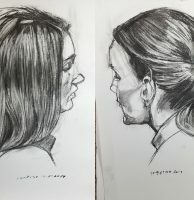 He used both parallel and contour hatching to achieve both a sense of form and volume, and retain some overall consistency across the drawing. 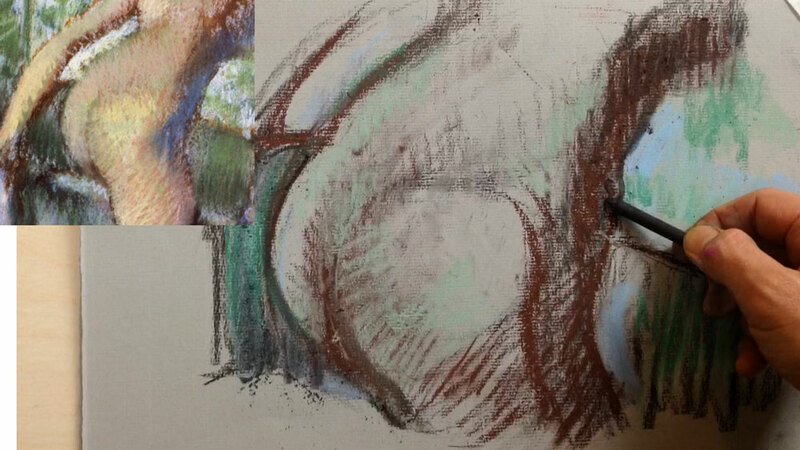 She then chose a picture of a head from Croquis Cafe to practise the skills she’d picked up from Degas. She used exactly the same pastel colours [show photo]. 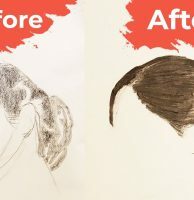 One difference was that she used a thin stick of charcoal, since she was doing facial features. 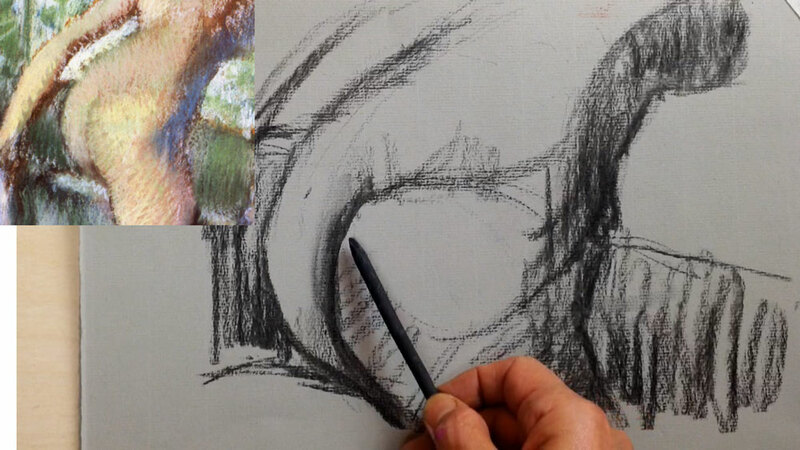 Again, she started with charcoal for the overall shape and tonal shapes of the head. At this stage, she already noticed that the drawing didn’t look like the head on the photo. Although achieving a likeness is not her primary concern here, it is a sign that something is wrong with the proportions. By simply aligning the position of the outer corner of the left eye and the chin, she realised the chin area needed to be altered. 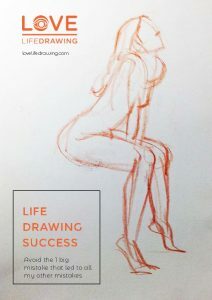 Check out the measurements lesson in our life drawing beginner series to understand more about that technique. She also noticed that the drawing lacked the nice roundness of the face, so she tried to add that with the colour layers. 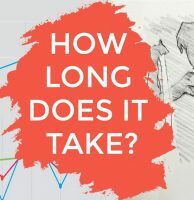 Measurements are great, but one of the best indicators that something is wrong when you get that feeling looking at the drawing that something just feels off. Trust that instinct. 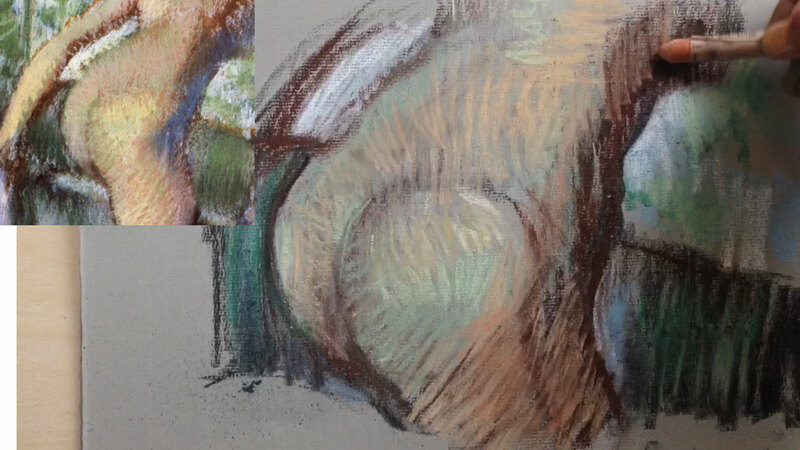 As with the Degas exercise, she put the dark and the cool colours first and added the layers of warmer lighter colours. Choosing colours isn’t always easy, but it was made much simpler here since she was just using the same ones as for the Degas exercise. As we’ve talked about before, learning drawing is not just about information and knowledge – your eyes and arm need to understand the information too. They do not speak English. They only understand work – so copying his work gives her eyes and arm what they need to really understand what his techniques. Copying your favourite artists is a very powerful exercise for rapid improvement. Now obviously you should never pass of other artists’ work as your own, but it’s fine to copy them for the sake of practice. When choosing an artist to copy, go with your own preference. You don’t need to choose some old master just because everyone says they’re great unless that’s the work you love. You should choose to copy the work that appeals to you. The beauty of pastel hatching is that you can create a mesh of different colours that work together, where all the colours are kept alive. You can see the underlying colour through the layers of hatching on top of it. If you look closely, you can see each colour – not blended or mixed with the others, but in its original glory, and that mesh of interlocking colours working together makes pastel hatching wonderful to look at. 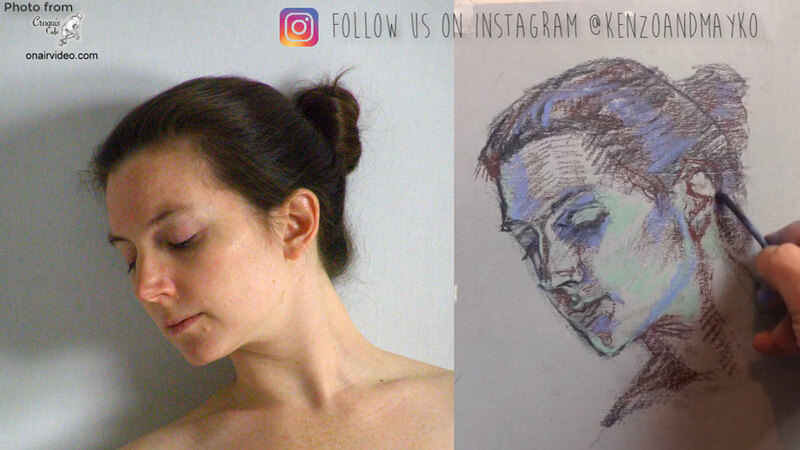 I hope you enjoyed seeing how this beautiful portrait came into being, with the help of a Degas drawing. Stay tuned for our next hatching video, where we will talk over the mechanics of hatching technique. If you haven’t seen it yet, check out our video/ article about how to use the different types of parallel, cross and contour hatching. Don’t forget to subscribe to the newletter below and to our YouTube channel because we will be posting every week, and follow us on Instagram where we regularly post great drawings with explanations of what’s working and what needs improvement. Thanks for watching! This video addressed all of my questions. I am learning without the aid of a teacher, but you seem to know my questions and answer them. That’s great – thanks Mike! I absolutely LOVE this effect. 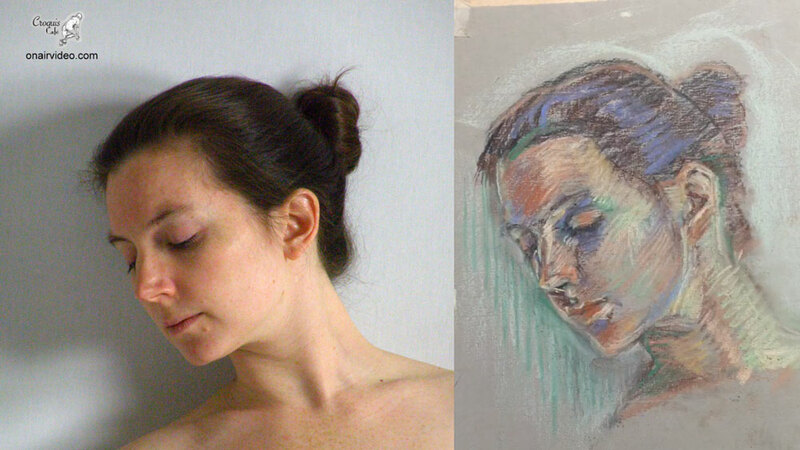 Mayko’s drawings have inspired me to get some pastels and try it out. The bold lines and colours are magnificent! Being colourblind, colours are a bit intimidating but I will give it a try. I am really enjoying Figuary as well. Every night, my wife and I get together to participate. Thank you so much for all this content. Love Life Drawing and Croquis Cafe are my favorite resources.